Hungarian Radio is owed something of a debt here, given its long-standing commitment to recording György Kurtág. The earliest examples come from 1955, the latest from 2001. The focus is on the series of Games (Játékok) in which he is joined by his wife, Márta. The choice of material for this disc was to an extent determined by the Kurtágs themselves, who selected from the surviving archive and concert material, choosing the most artistically persuasive performances. Kurtág himself has ensured that the Games sequence, composed over a roughly four-decade span, falls into a convincing and coherent sequence such as the Kurtágs would have played in recital. The books of Games are often seen as rather pedagogic but in this way they are shown to be very far from mere studies. Then, as well, we are fortunate inasmuch as many of them are heard in performances given shortly after the works were first composed. Kurtág himself plays solo piano on six of the 43 individual pieces sharing the remainder with Márta. The Games sets derive from two sequences of radio recordings, one from November 1978 and the other from June 2001. The Suite for Four Hands was recorded back in February 1955. 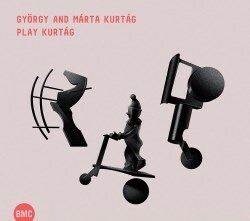 Kurtág plays the Games piece in memory of György Szoltsányi with especial sensitivity, vesting it with the kind of fragrant grace that is evoked in the threnody of the Bach-Marcello slow movement transcription. The deft harmonic drift of these pieces is found most succinctly in the Hommage à András Mihálywhilst matters of piano sustain and extreme dynamics are pursued in the ingenious Shadow-play (track 5) which acts as another act of homage, this time to Somlyó György. There again, one also encounters allusive nature painting in a piece such as Thistle, a study of scrupulous clarity, and unexpected vehemence in the dramatic Palm Stroke 2. Most of these pieces are very brief, and some last no more than 20 seconds, but it’s remarkable how much density, how much purpose they exude. When he takes a more horizontal approach, as in Hand in Hand (track 33) the results are equally powerful. Whether explicit or elliptical these treasurable preserved performances offer playing of compressed characterisation. When one listens to the live performances, made in June 2001, one can relive the elliptical and quiescent moments alike. Only the Old School brio of the Suite for Four Hands is heard in boxy sound, but then it was recorded back in 1955. Its baroque-derived charm emerges intact. There are fine notes and there’s good, honest sound quality in this valuable and rewarding example of the Kurtágs’ pianism.